If you are in California and you want a legal to drive, over 25 year old vehicle, you know it's not as simple as the rest of the country. We have navigated this obstacle , and can offer cars, fully legal for California. 1967 model year vehicles and older - no modifications and testing are required to register the vehicle in California. increasingly difficult to meet. Today, this requirement, while not impossible to meet, would require testing expenses and modifications that far exceed most vehicles value and would make little sense from a collectors standpoint to attempt. Some limited exemptions apply to individuals moving to California with vehicles of these years registered in their home state for at least a year before moving to California. Contact us for more information. 1975 model year vehicles to the present - (EXCLUDING any vehicle obtained by a California resident within two years of its date of production) require a "Certificate of Conformance" issued by the ARB after a successful laboratory test. This test is administered to the same standards required of new vehicle manufacturers, and for the model year of the vehicle . However, unlike new vehicle manufacturers, as an individual you are not required to meet the full range of additional testing and equipment standards such as On-Board Diagnostic (OBD) requirements, durability testing, low emission fleet averaging, or Zero Emissions Vehicle testing (LEV and ZEV requirements). So while these standards reference what a manufacturer must do, when required by the Direct Import requirements they apply to individuals importing a used motor vehicle. Some limited exemptions apply to individuals moving to California with vehicles of these years registered in their home state for at least a year before moving to California. Contact us for more information. Motorcycles and heavy-duty engines - (used in trucks and buses) are required to comply with CA or USEPA from the date of manufacturer, no after-the-fact modification is permitted for products first sold outside the US market. Diesel vehicles - 1979 model year and older vehicles with original-equipment diesel engines are exempt from Direct Import lab testing requirements. Please note that any vehicle converted to operate on diesel fuel is subject to lab testing requirements if it is a 1968 model year vehicle or newer. 1) What cars can I register in California? A - We are now able to bring cars into California compliance. More information - http://www.gtrusablog.com/2015/11/first-california-legal-nissan-skyline.html .California has its own EPA, called the ARB(Air Resources Board) often called the California Air Resources Board. The ARB sets California requirements. California is the only state to be able to set its own emissions standards, separate from the Federal EPA. So in the case of imported (direct import) vehicles over 21 years old, while they are Federally legal to import, the ARB controls the registration of vehicles though the California DMV. This makes this a difficult question to answer unless you go through all the questions below. 2) What are direct import vehicles? Direct import vehicle means any light-duty motor vehicle manufactured outside of the United States which was not intended by the manufacturer for sale in the United States and which was not certified by the state board pursuant to Article 1 (commencing with Section 43100) of Chapter 2 of Part 5. Added Stats 1989 ch 859 § 1. 3) What is a used direct import vehicle? For purposes of this chapter, used direct import vehicle means any 1975 or later model-year direct import vehicle not required to be certified as a new direct import vehicle pursuant to this part. For purposes of this section, the age of a motor vehicle shall be determined by the following, in descending order of preference: (a) From the first calendar day of the model year as indicated in the vehicle identification number. (b) From the last calendar day of the month the vehicle was delivered by the manufacturer as shown on the foreign title document. (c) From January 1 of the same calendar year as the model year shown on the foreign title document. (d) From the last calendar day of the month the foreign title document was issued. 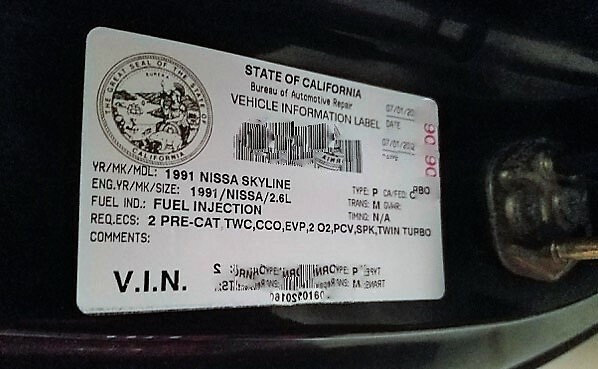 4) What vehicles may be registered in California without certification? The requirements of Section 44202 do not apply to any motor vehicle having a certificate of conformity issued by the federal Environmental Protection Agency pursuant to the federal Clean Air Act (42 U.S.C. Section 7401, et seq.) and originally registered in another state by a person who was a resident of that state for at least one year prior to the original registration, who subsequently establishes residence in this state and who, upon registration of the vehicle in California, provides evidence satisfactory to the Department of Motor Vehicles of that previous residence and registration. Added Stats 1985 ch 1138 § 2. 5) I have a 1974 vehicle that I want to import, can I register it in California. 1968 model year to 1974 model year vehicles: California does not recommend the purchase or importation of these years of NON-USA vehicles, even if currently registered in another state. These vehicles require compliance with USEPA requirements in effect on the specific date of 11/15/1972. This provision when written, was considered by the California legislature as a gradual phase-out of very dirty non-collectable types of imports, as this specific requirement was understood to become increasingly difficult to meet. Today, this requirement, while not impossible to meet, would require testing expenses and modifications that far exceed most vehicles value and would make little sense from a collectors standpoint to attempt. Some limited exemptions apply to individuals moving to California with vehicles of these years registered in their home state for at least a year before moving to California. Contact us for more information. 6) What year non US spec vehicles are exempt from California emissions requirements? A - 1967 model year vehicles and older: no modifications and testing are required to register the vehicle in California. 7) What about diesel vehicles into California? A - 1979 model year and older vehicles with original-equipment diesel engines are exempt from Direct Import lab testing requirements. Please note that any vehicle converted to operate on diesel fuel is subject to lab testing requirements if it is a 1968 model year vehicle or newer. 8) How about importing motorcycles? Motorcycles are required to comply with CA or USEPA from the date of manufacturer, no after-the-fact modification is permitted for products first sold outside the US market.